For the tzatziki: In a blender combine all tzatziki ingredients. Pulse until fully combined. Pour into a small bowl and chill for at least one hour before serving. For the kofta: Soak 28 wooden skewers in water for at least 30 minutes. In a medium bowl, combine all kofta ingredients. 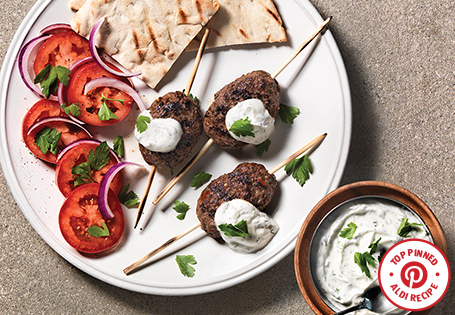 Evenly divide beef into 28 balls and form around top of skewers in an oval shape. Chill skewers, covered, for at least 30 minutes before grilling. Grill skewers over medium to high heat, to desired doneness, about 8 minutes per side for well done. Serve immediately with dipping sauce.